Some crave superbly crafted stories, for others it's wonderful acting or beautiful cinematography. But when I sit down for a bit of cinematic entertainment what I'm really looking for is two Japanese stuntmen bashing into each other at random while a load of fireworks go off around them. Yes, I'm a devotee of Kaiju, Japanese rubber-suit monsters, and the last few episodes of Lowlife: The Deal have given me the chance to scratch that particular itch in public. 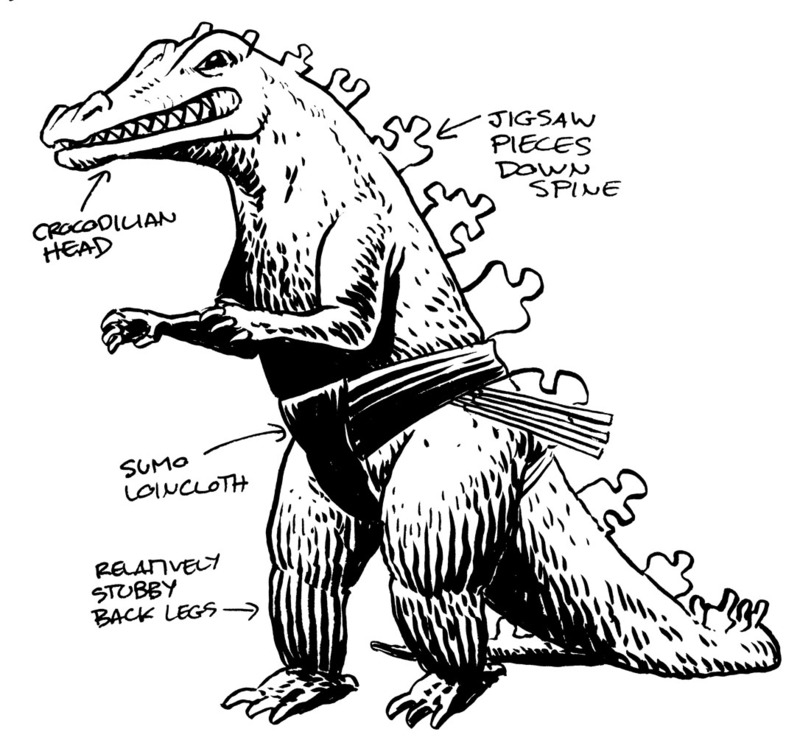 Frank's avatar, based loosely on Hedorah, the Smog Monster (from Godzilla vs the Smog Monster, Toho studios 1971). 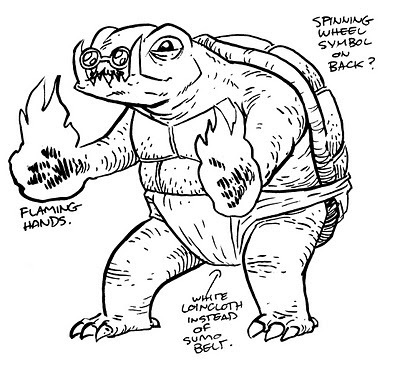 I described this creature to Rob Williams as "a giant ambulatory turd," which seemed a perfect alter ego for Dirty Frank. The little doodles top left are me working out his rough body shape. 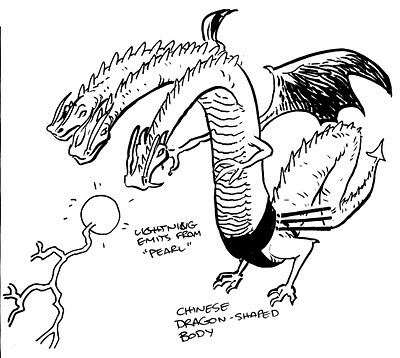 The two monsters from the initial sparring session in part three. The one on the left is based on regular Godzilla bit-part player Anguiris (a name that derives from the Japanese difficulty with saying Ankyllosaurus, first appearance Godzilla Raids Again, Toho 1955)). The one on the right is half-Godzilla, half Spinosaurus Egypticus (the crocodilian head), half jigsaw set (in the strip, I extended the jigsaw pieces all over the body too, making me glad I only had to draw him for one episode). 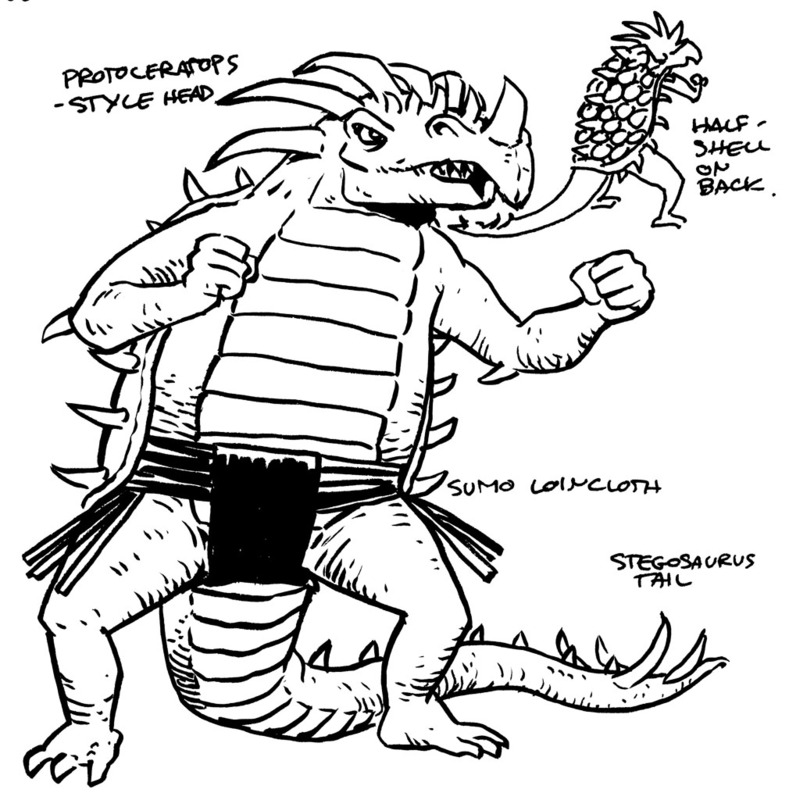 This guy is based on non-Toho star player Gamera the giant turtle (first appearance Gamera The Giant Monster, Daiei 1965, most notable appearances in three revival films Gamera Guardian of the Universe, Gamera II: Attack of Legion, Gamera III: Revenge of Iris, Daiei 1995-1999) . His burning claws are a kaiju-nerd reference to the "flame hand" used by Gamera to kill the monster Iris at the end of Gamera III: Revenge of Iris (Daiei, 1999). But why the little glasses, moustache, white loincloth and (in the finished version) spinning wheel symbol on his chest? 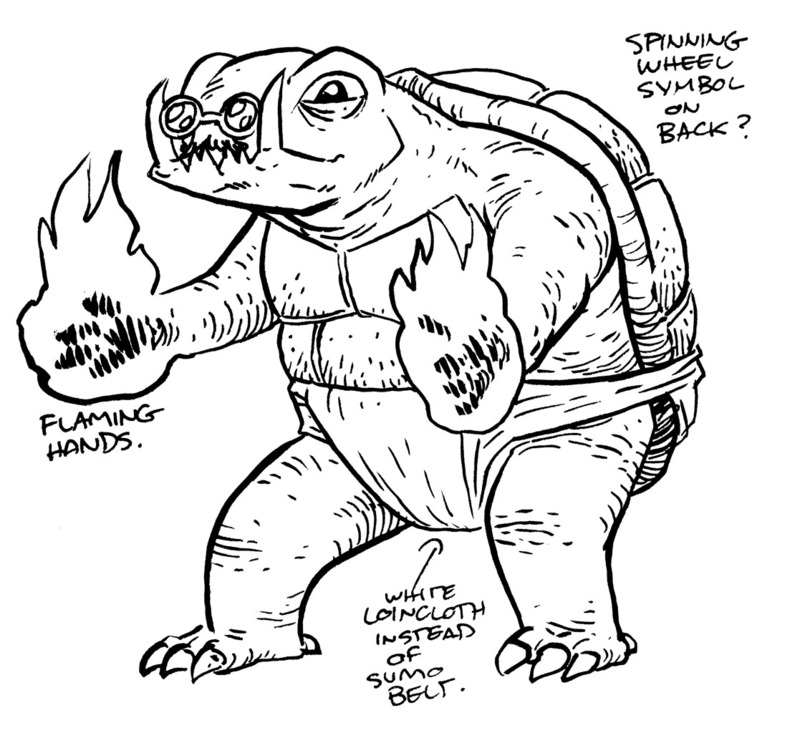 Because he's Ghandi'd Gamera, that's why. No giant monster slug-fest would be complete without the prettiest monster of them all - giant three-headed golden dragon King Ghidorah (First appearance Godzilla vs. King Ghidorah, Toho 1964, most notable appearances Invasion of the Astro Monster, Toho 1965, Destroy All Monsters, Toho 1968, Godzilla vs. King Ghidorah, Toho 1991, Godzilla: Final Wars, Toho 2004). 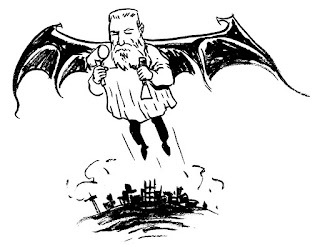 KG is a difficult one to pastiche because his profile (three heads, bat wings, no front legs) is so distinctive. 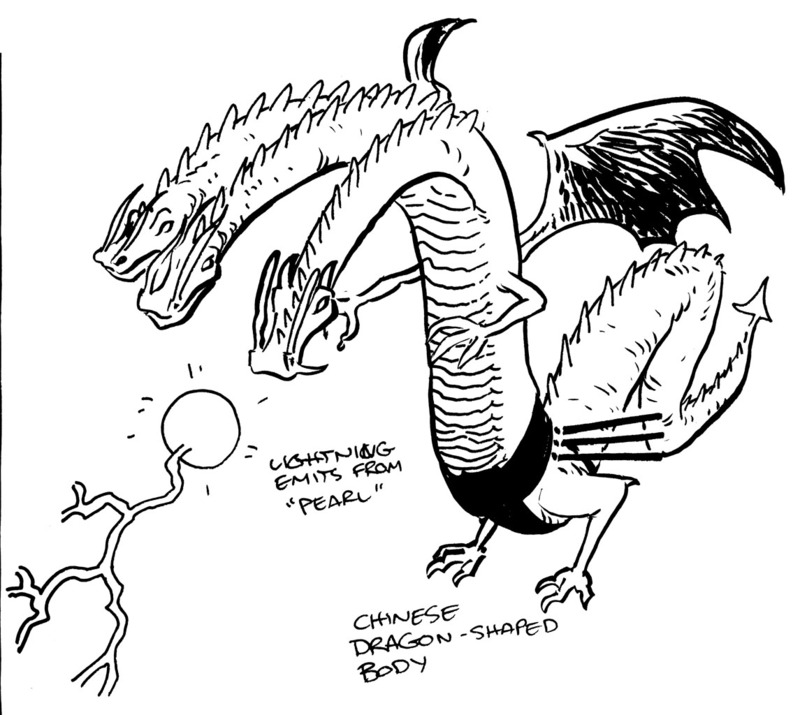 My eventual solution was to turn him into a Chinese dragon - which then gave me the idea of him using the 'pearl' (Chinese dragons are traditionally shown chasing a pearl) as an emitter for his death-ray. This guy appears briefly in the background of a couple of panels in episode 6 (he's really just there to make up the numbers). 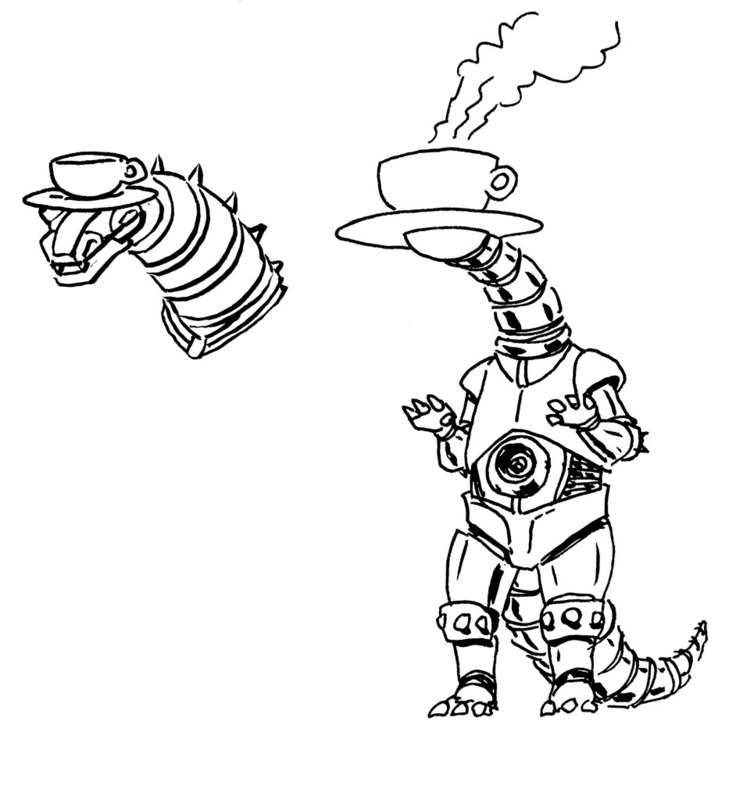 Why a robot dinosaur with a cup of coffee for a head? Because he's Mochagodzilla, naturally (see Godzilla vs. Mechagodzilla, Toho 1974). 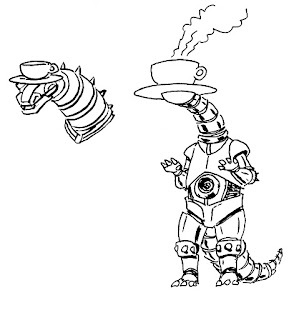 This final one isn't from Lowlife at all - it's an old sketch from 2001 showing my long standing love of giant monster puns. Behold - Rodin the flying monster! Great blog! Really like your work and enjoyed your discussions of stuff. I'm pretty new to this business, looking for work as a comic artist right now (just finishing my first ever graphic novel for print early next year). Also a big fan of Kaiju, I have a bunch of nice Ultraman paintings cycling on my desktop BG at the moment!